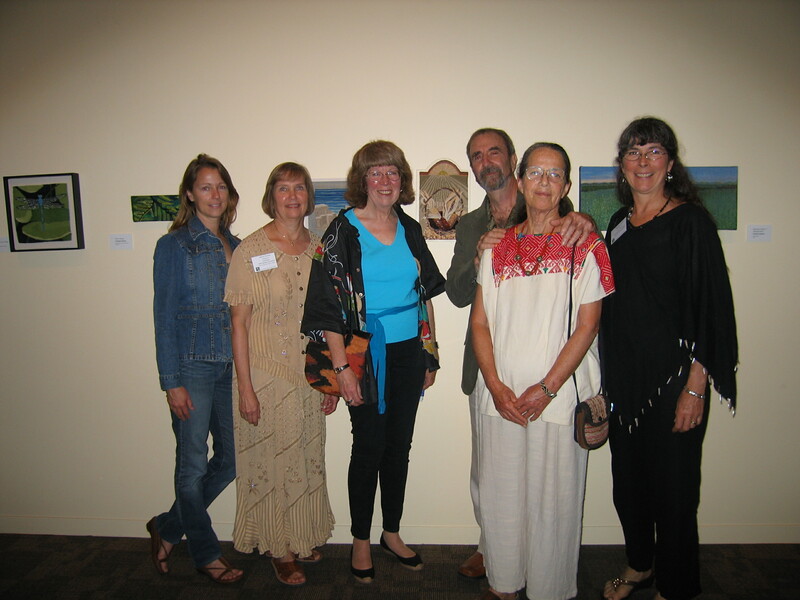 “Contemporary Tapestry Work and Influences” a lecture with Jane Kidd will be held on Wednesday, July 29, 2009 at the Bayside Inn (Court Room) in Parksville, BC at 7:30 pm. Jane Kidd is coming to the Parksville area to teach a 3 day workshop for the local tapestry study group weavers. The course is full but Jane has offered to give a lecture to the public the evening of July 29. Needless to say we are very excited to have Jane visit with us and share her enthusiasm for tapestry. In the meantime, those of us who are participating in the workshop are gathering our resource materials, ideas and equipment together for three days with her. The course has to do with strategies for design and she will work with each person individually as well as with the group. Each participant was asked to bring 1 or 2 ideas they would like to work on. I will report more on this event later. Last Wednesday, June 23 was the last of a four day course for intermediate tapestry weavers. Eight students and I met from 9:30 am to 3:30 pm to discuss new projects and new techniques as well as getting started again on old projects. What most of the class wanted was inspiration and a jump-start. The first day each student told the others what they would individually like to accomplish in the class. You can imagine that the challenges, projects and goals were as diverse as the eight people taking the course. A few people did samples of demi-duite, others of hachures. Some worked on cartoons and designs and others continued on previous projects. The class had fun making up sayings about what they had learned in the hopes of remembering these words of wisdom when weaving on their own. I thought we should make a list and share with others some “rules” (loosely worded please note). I always remember a “rule” that Jan du Bois of Santa Fe said: if you cannot decide whether to move over one warp thread or not, then don’t. Janine Wilkins from our class said her new “rule” was: you just can’t start anywhere. Also you must complete the pass in order to remain in the right sheds. If you are in the wrong shed, use the half pass to get you going again. Archie Brennan’s rule on designing: SIMPLIFY! We had lots of good giggles and shared inspiration in this class and we look forward to getting together again in the Fall. Last Monday, June 22 was registration for the Maiwa Handprints Symposium of workshops and lectures. I have tried for 3 years now to get into the Natural Dyeing Workshop with Charllotte Kwon. Registration opened on the website and by phone and in person at 10 am. I was driving my friend to an eye appointment in Victoria…so pulled over and my better half took over the driving. I went into the backseat and kept redialing the number. It was always busy. We arrived at our destination in Victoria early for the appointment with the plan to get some lunch. So I turned the phone off, we parked the car, and walked to a restaurant. After our order was taken, I started dialing again. After about 5 min, I actually got through to a wonderful lady who asked if she could help me. I said I would like to register for the Natural Dye Workshop….I couldn’t believe my ears when she said there was one place left and it was mine!!! I am very excited to participate in this class. It will be for four days in September at Maiwa East. I love natural dyes, teach classes, and dye lots of my handspun yarns. Now to expand my knowledge with an expert like Charllotte is wonderful. I will keep you posted on my dyeing adventures in September. I have just completed weaving and mounting my entry for the exhibition “Weaving Within” small format tapestries woven by the members of the British Tapestry Group. The title was chosen to reflect the size of the tapestries (max. 11″ by 17″) as well as the fact that it is only open to members of the BTG. The exhibition will be shown at Stirling Castle and the Stirling Smith Art Gallery and Museum from 12th September to 8th November 2009. Four speakers: Joan Baxter, Sara Brennan, Dina Ward, and Rudi Richardson are part of the Conference Day agenda scheduled for Sept 9. On Sunday, Sept 10, there are workshops scheduled. After the exhibition the BTG is hoping to have the tapestries as part of an on-line exhibition. I have never exhibited overseas and I find the process exhilarating as well as nerve-wracking. CD of images, entry forms to be mailed. Then the actual shipping of the tapestry in mid-summer. Due to the small format size this should not be too difficult to do. The piece I am sending is part of a new series I have started: Nature Designed. I will be posting photos and artist statement in the Gallery section very soon.